Synchrotron light is an accelerator based light source that covers the complete electromagnetic spectrum from infrared to hard X-ray. It is intense, bright, fully tunable, highly polarized, with a time structure useful for many types of dynamics experiments. Aside from the visible, near-IR and near-UV where lasers dominate, the properties of synchrotron light far surpass those of available lab sources. Historically, synchrotron light was first observed in 1947. For a long while it was considered just a nuisance to particle physics experiments since it is the major source of energy loss in all particle accelerators with greater than ~200 MeV energy. In the 1960's and early 70's pioneering use was made of the light in a parasitic mode - so called first generation. In the mid-1970's its unique properties and value were beginning to be appreciated and facilities totally dedicated to synchrotron light, such as the National Synchrotron Light Source (NSLS) were constructed. These early dedicated facilities, in which most synchrotron light is produced at bending magnets, are called second generation sources. In the last decade new ways of enhancing the yield, and particularly brightness of synchrotron light were developed. These use high field magnetic structures placed in straight sections which make wiggles (long period) or undulations (short period) in the charged particle trajectory which reinforces the light emitted by the accelerated electrons, much as multiple passes through a medium with a population inversion is the basis for the special properties of lasers (see Fig. 1). A wiggler generates a quasi continuum, with a flux higher than a bending magnet roughly in proportion to the number of wiggles. In an undulator the self-reinforcing aspect of the interaction of the electron beam with the magnetic structure leads to an N2 gain in brightness, a highly collimated, partially coherent point source, and a very highly structured energy spectrum. 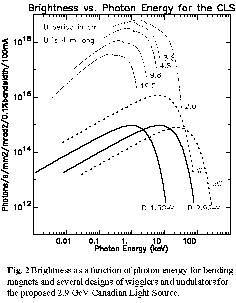 It is the concentration of all of the emission into the narrow undulator lines that creates the many orders of magnitude higher brightness of undulators. The peak energy can be tuned by changing the gap between the magnet poles - a technological challenge given the forces and precision required, but one which is fully solved. Synchrotron light facilities which emphasize insertion devices, and have a high brightness electron beam (small, highly collimated) are called third generation sources. It is these sources that are creating tremendous excitement in many areas of science today. Fig. 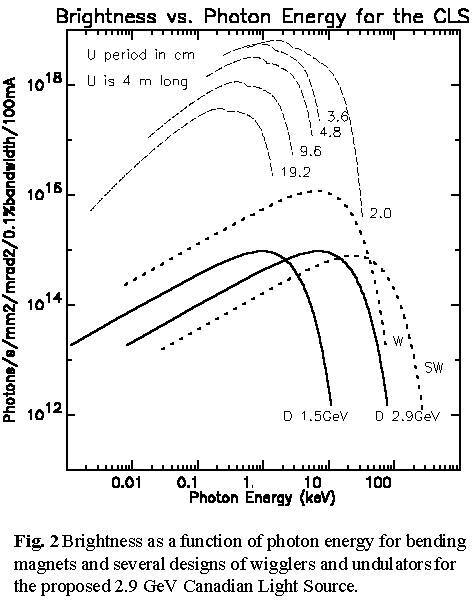 2 plots the brightness as a function of photon energy of bending magnets and various wiggler and undulator devices planned for the Canadian Light Source (CLS). Fig. 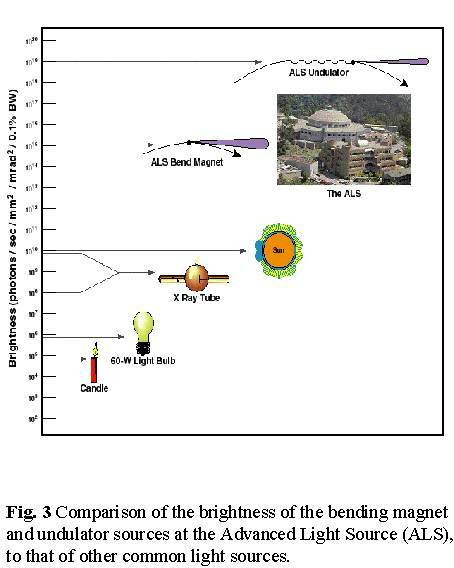 3 compares average brightness of bending magnet and undulator light from the Advanced Light Source (ALS) to that of other light sources, such as an X-ray tube and the sun. The impact of third generation synchrotron light in the 1990's is conceptually very similar to that of laser light in the 1970's. At present there is much activity in designing and developing novel types of insertion devices with properties optimized for special experiments. 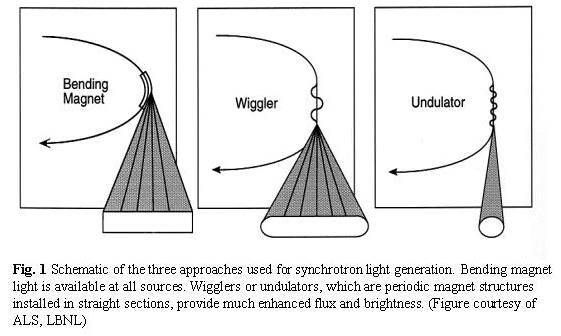 At third generation light sources, there is an ongoing dialectic between the accelerator physics and the synchrotron light experimentation, since both aspects need to be optimized simultaneously to obtain the best results. Details of the physics of synchrotron light production , and applications are available in many books , journal articles and popular reports .